What a singer. When, only now and then, a singer's basic sound is completely arresting, it's like a wake up call. You can have attitude, you can be dramatic, elastic or gymnastic--but when you have that sound, you can just sing, and it's all there. You can dial in degrees of whatever else you want, but that's just icing on the cake. And it's the cake they call angel's or devil's food, right? A dozen or so albums into a charmed career, Suzy says she's just realizing she's actually the thread that ties it all together, not whether she's singing Country, or Swing, or Jazzy Pop. And the last of those is the place where Sweet Danger goes with assured poise. Though most of her fantastic work has been in the Country vein, her fans followed her when she cut the landmark Swing record with her old friend Ray Benson and past and present members of Asleep At The Wheel. It's a cinch that they will be along for the ride here to witness Suzy absolutely killing the great Beth Nielsen Chapman and Annie Roboff song "Right Back Into The Feeling," or the mindblowing cover of the Peter Cetera classic "If You Leave Me Now." Sometimes you don't really get how great a singer is until they come out of the bag that made them famous. We said jazzy pop, but at times it feels also like a really great soft rock album. (Considering that the record in this issue by younger counterparts The Silver Seas struck us similarly, we think we see a very welcome pattern.) That her soft rock CD has a jazzier feel might well have something to do with the experience and pedigree of her players, and a different range of influences. Whatever it is, it works for me. Instead of Billy Joel or The Beach Boys, there are moments on Sweet Danger that certainly bring Steely Dan or Stevie Wonder to mind. But none of those groups had a voice like this. And it's the singer that drives the music deep into your heart or your soul, and that gives the lyrics wings. 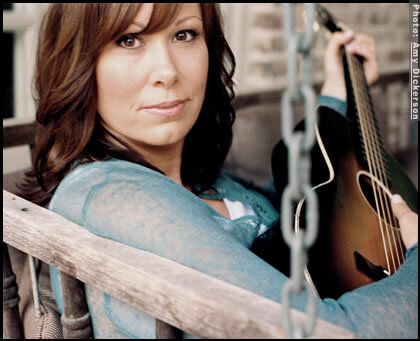 And Suzy Bogguss does that, all of that. What a woman.